So the actual method of operation that we use is by buying this paper, and that’s the paper that I’ve always looked for. Whether I was a commodity broker or I was in the oil and gas business or in the precious metals business, I always wanted to let everyone else do the hard work, let them kill themselves, looking for that guy that sounded like a deal. And then let me have him because I am a closer, and I will close that guy. And that’s how we think here, and that’s what’s been working for us. Let’s face it, 29 years with an A-plus rating, yeah, there’s a lot of service involved. I’m a one-man operation, other than my supports. I’m the only salesman, so it’s easy to keep things under control. And when you’re good… I take care of my boys. I appreciate everything my customers do for me. My lifestyle, my life, is because of you guys. So why would I hurt you? Why would I bite the hand that feeds me? I’m going to do everything I can to make you happy. 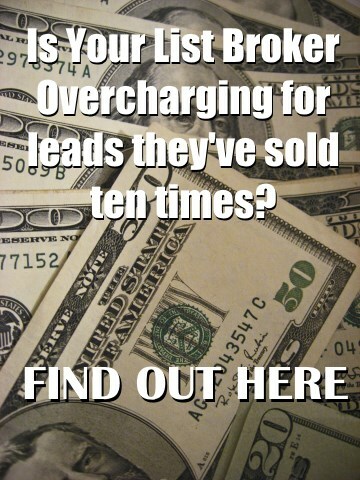 To make sure you’re satisfied, but most important of all, that you’re making money from my leads. And that’s the difference between me and the rest of the guys out there. So remember, if you’re looking for accredited investor leads, accredited investors, lead, leads, accredited investor lists, it’s all the same, guys. It’s the same particular name. An accredited investor lead is one name, address, and phone number. It’s one person. Accredited investor leads is a bunch of them. An accredited investor list is a number of leads, a number of individuals that were surveyed and mailed a private placement memorandum. So I hope I cleared up all this craziness. If you have any questions at all and you want to buy the best accredited investor leads in the country, give me a call, John Fischer, 561-981-8777. Have yourself a beautiful day, and God bless. HAVE QUESTIONS? EMAIL US NOW!